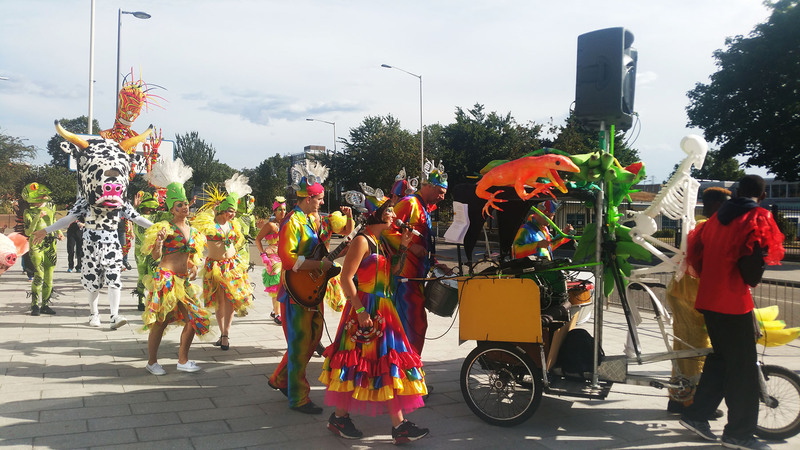 Last weekend Abbey Green and Barking Town Centre was transformed for the Night of Festivals. There was a vibrant carnival parade, Samba and Latin American Music, and performers including myself throughout the day. 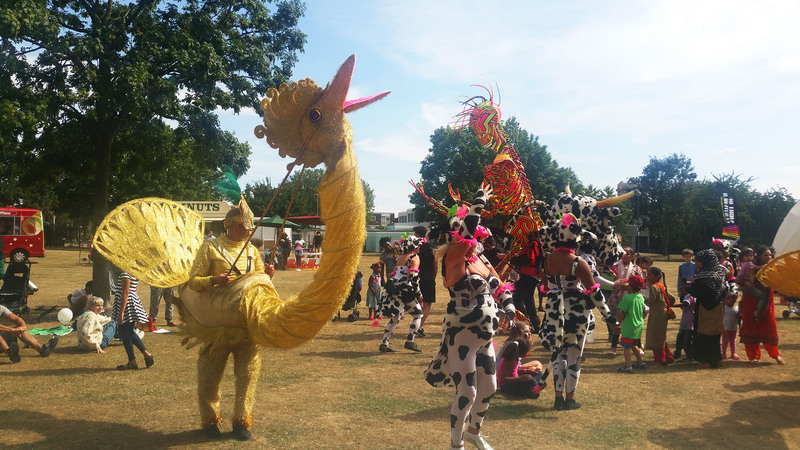 Art Reach had organised the event to celebrate values of freedom through artistic innovation as part of the 50th Anniversary celebrations of the London Borough of Barking & Dagenham. My time was spent during the festival inside of a unique Yurt in the middle of Abbey Green. 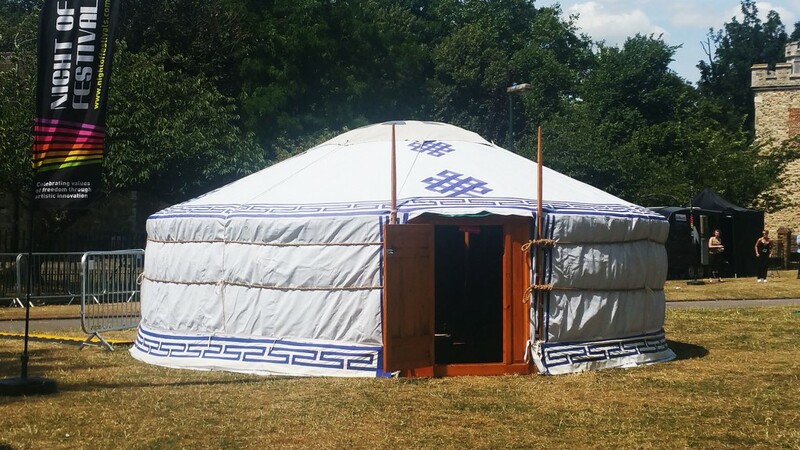 Adorned with soft cushions and mats, the atmosphere inside the Yurt was intimate and relaxing. Just perfect for an afternoon of telling folk tales from around the world. 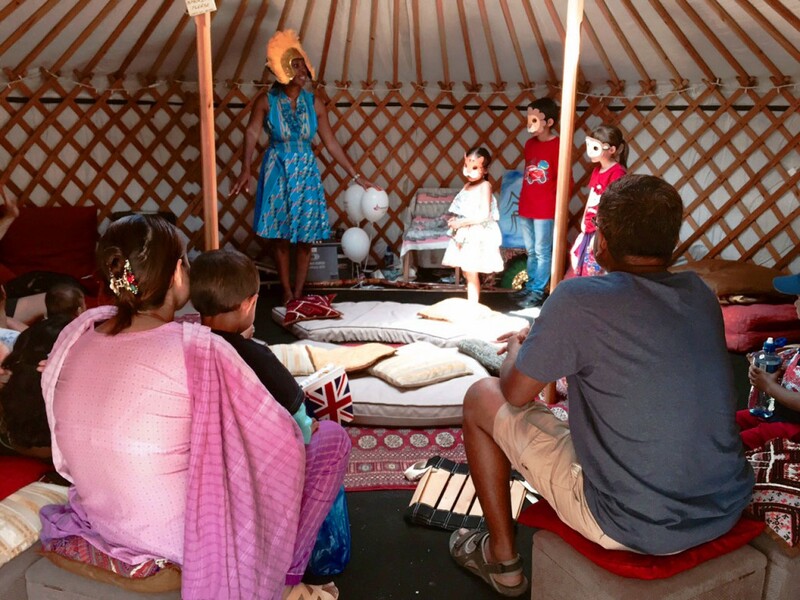 It was a beautiful sunny day but that didn’t stop people heading inside the storytelling Yurt. My challenge for the day was going to be, telling tales to a mixed age-group of audiences. There would be children, toddlers, teenagers and of course adults. Being a mum to two young girls, I know how agonising it can be to sit in a group where your children are being entertained but you are bored stiff. So I was determined that somehow there was going to be something for EVERYONE in my storytelling sessions. I’d decided to tell some trickster tales of Anansi. They are my favourite and although some of the stories contain animals, the actions of the characters reflect human traits of vanity, deceit, stubbornness and more. I began each tale addressing the adults, sharing with them the history of this genre – from people who may have been oppressed and enslaved. It was their way to trick their oppressors by having characters who were animals whilst telling tales about the weak and insignificant overcoming the powerful. I told tales of impossible challenges being attempted against all odds. At times, I was talking to the adults, whilst they nodded in recognition of the situation. Then suddenly the children would also start nodding and yelling ‘yes you should always give it a try!‘ I was so surprised at this reaction and realised that tales of difficult challenges and courage, are relevant to all ages. Not just adults! Throughout the day, some children and adults returned to hear and take part in more of my storytelling. Thankfully I’d prepared plenty of stories so that they always heard something new. But there were a few children who came back to hear the same story if they hadn’t had a chance to take part previously. Children as young as 4 and 10 years old then felt confident to take the lead and repeat various chants and actions because they’d heard one of my stories earlier that day. I’m waiting to hear another story mum (said one boy when his mum tried to leave the Yurt). It was a fun packed day and I’m glad that I had a chance to catch the Carnival parade with their amazing costumes. I’ll be storytelling at the Night of Festivals in Leicester later this year which will be lots of fun.